Chicago-based, St. Louis bred rapper Smino will be hitting shows nationwide for the first half of 2019. The 32-date ‘Hoopti’ Tour that includes dates in Europe and at Coachella 2018 will kick off at Academy 3 in Manchester, UK on March 16th and wrap up nearly two months later at Saint Andrews Hall in Detroit on May 17th, 2019. Smino’s “hometown” Chicago date will be on Saturday, March 23rd at perhaps Smino’s biggest Windy City venue to date — the House of Blues. The tour is presented in partnership with Smino’s music collective and record label Zero Fatigue (which operates under Interscope Records). Other rappers signed to the label include frequent Smino collaborators Bari and Jay2. The label is run by manager and studio owner Chris “Classick” Innumberable of Classick Studios. Co-presenting the tour is ‘Ones To Watch’ - a Live Nation backed music discovery platform made up of “a collective of bloggers, music geeks and concert fanatics based in sunny L.A.” The platform has supported and presented a wide variety of tours from up and coming artists like Sabrina Claudio, Hobo Johnson, LANY and Chicago’s own Kweku Collins. Smino will be touring in support of his 2018 sophomore album NOIR, which landed at #3 on These Days ‘10 Best Albums of 2018' list. The full dates can be found below. 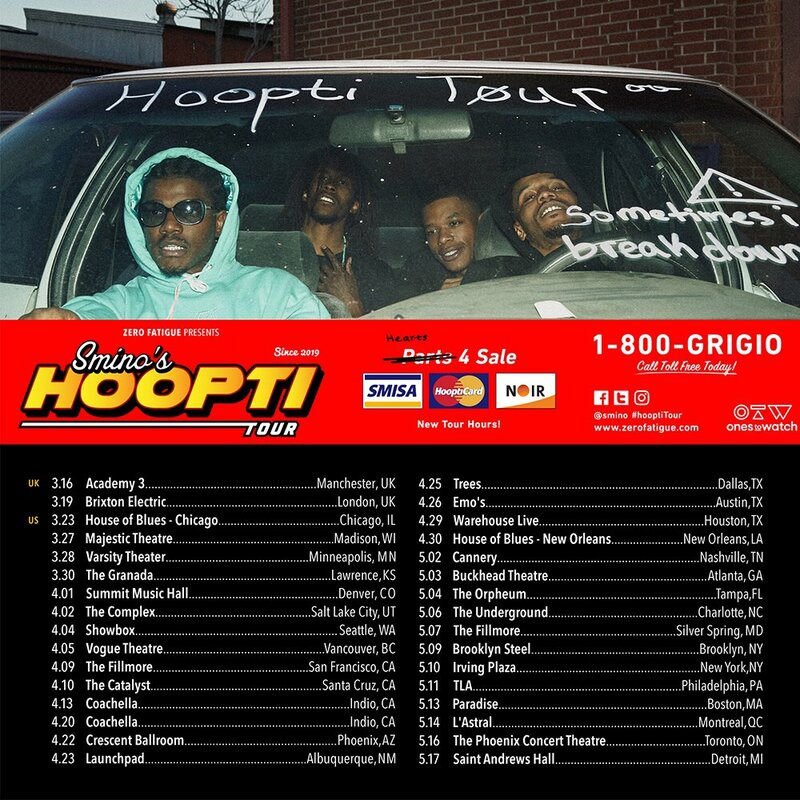 Tickets for Smino’s ‘Hoopti’ tour will be available Friday, Jan. 18, at 10:00 AM CST at Smino’s Facebook page.